If you want to browse old stocks that have not been moved to new site, click the categories. Click links below and it lists latest additions of new store. Material of this current list is slowly being moved there. You can also browse alphabetical and use search. "The first release from Totuuden Sarvi Levyt is a piece of Finnish art destined to remain in the minds of those who hear it. The debut mini-album by Armon Kuilu is a funereal musical journey. two long progressive compositions built out mostly of classical piano. strings. orchestral drums. singing. prayers and invocations in male and female voices. More of a gothic work than a total assault on the senses. yet one must remember that the word gothic is often abused in connotation with just a melancholic form of new age entertainment music but here the soundscapes bring to mind images of forlorn cemetaries. initiatory cults. bloodletting. woodlands and altered states of consciousness. At times the melodies of chamber music break out into squeals. groans and crackling which haunt the space and resonate with the Finnish poetry. that most of the time reminds one of a satanic ceremony. Some passages sound familiar to the listeners of European avantgarde and progressive music such as ACTUS. ART ZOYD and releases from the label Athanor. Post-industrial fans should also listen to this work but remember that this is not your generic so-called occult album with the usual Crowley spoken parts. Instead this is a deeply personal work with challenging classical and sometimes jazz or progressive melodies composed by the master behind the project and performed by real musicians with authentic instruments and also utilizing real actors for the various voices and spoken parts. Believe me. you will hear the difference. The mini-album comes in a black & white sleeve with a full color 8-page art booklet (size 7x7"). built from nature-mystical imagery shot on infrared film." THIS IS PRE-ORDER! CD WILL BE OUT IN END OF MONTH! Finally for the first time. CD version of magnificent "Evil Mysteries" 10". Including already classic anthem Azazelin T�hti ! Out Now! includes all the EP material; �Black Ceremony� & split 7� eps, bonus songs, and some rehearsal tapes from between years 2002-2009. Artwork contains pictures between hateful years of worship to illumination. Cover art is from our archives of sacred wisdom by J. Nefastos, made in 2002. Compilation released by band's long time label, Northern Heritage. BAPTISM is known as one of the most reliable Finnish black metal acts with it�s instantly recognizable. yet deeply traditional. sort of puritanical "Eliterian" musical worship and esotericism. Referencing both older metal and a newly awakened purpose for a more extreme form of Luciferian art. BAPTISM�s work is always more than mere music - it�s a theistic black metal ceremony. As it is. "Grim Arts of Melancholy" stands as a natural continuation of the work BAPTISM initiated in the 90�s. Sargofagian�s articulated vocals unveil mysteries of a blackest nature in the foreground of a deeply darkened. almost insane. mostly mid-paced riffscape. which seems this time to have kept to a minimum the use of beautiful counterpointing of melodies. Old-school thrashing parts are captured amidst songs in their flight across godless depths. yet return to obscurity as soon as the listener is awakened from the morbid trance of a mid-paced minor key hammering. For most of the time the whole album sounds like one single extended ceremonial track dedicated to Azazel or some other force whose name is unknown to mankind. It achieves this atmosphere without using standard tricks such as extremely lo-fi production; in fact. this one probably has the clearest and most dynamic production BAPTISM ever had. It serves it�s purpose here to highlight the nature of the album as a sort of anti-symphony. a prayer. a clear vision of doom. The messages of BAPTISM�s "Grim Arts" are serious prophecies. not entertaining background music! 6 panel cover booklet including exclusive artwork and for the first time all lyrics printed also in CD version. Re-issue of classic Baptism release that was originally very limited mcd and lp. This version includes all material of vinyl version, making both formats equal in length. This is pre-order! Shipping in mid/late may! 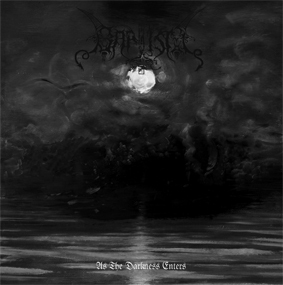 2010 album of Clandestine Blaze underlines the core of black metal as it has been interpreted by it. Utmost focus on the core elements of riffs. melody. song structures and lyrics. leaving out everything unnecessary. In stripped down simplicity of sound. music and artwork it continues logical journey since Church Of Atrocity. with more distorted. lethal and fierce sound. Northern Heritage. 3 pressings before has been made by Blackmetal.com and latest been sold out for years (came in 2006). Now 4th marks it's return to Northern Heritage's catalogue. Music is 100% same (no remastering etc!). cover artwork is slightly different - like it has been in most pressings. No new additions. just adjusted old graphics. Significant difference would be that cover is 8 page booklet with all lyrics. including also previously unseen outro lyrics! NH-001 / 2012. Clandestine Blaze 2013 album is another step widening the concepts started in previous albums. 40 minutes of pure Finnish Black Metal! Out Now! 2015 album of Clandestine Blaze. Black Metal. Northern Heritage. One of utmost Finnish cult demos from past. 50+ minutes of original black/death worship. Released by: Last Rites, exclusively distributed by Northern Heritage and Werewolf records! Merciless black death with violent lyrics. Out end of month, same time as CB LP! intro + 3 songs in 24 minutes. Previously been released by NH as 10" vinyl, limited 400 copies and sold out long ago. CD version is re-mastered with louder and clearer drums. Booklet with lyrics and lay-out following the dark style of original 10" version. Raw, but well played black metal ! See their interview in NH#3 zine! Northern Heritage. Killer old school attack. contains both the slow and painful tracks and midpaced lethal attacks. Hellhammer / Onslaught / Deathstrike etc.. Not one of those mindless retro projects with silly names and intentional ultra cliches. here�s the real deal. Originally pressed only 500 copies. now 2nd edition of 500 ! Northern Heritage. CD collects all Inferi demo material before the debut album. Includes complete unreleased demo #3 as well! 58 minutes of raw and depressive Finnish black metal. Released by: Last Rites, exclusively distributed by Northern Heritage and Werewolf records! Phlegein completed their 2nd full length, "From The Land of Death" album! They offer absolutely strongest material so far! Razor sharp sound, ripping vocals, excellent songs of pure Finnish black metal! Each song of album is strong, filled with killer riffs. Northern Heritage NH-090. Re-pressed! Heaviest and darkest black metal ritual emerging from Finland! Imagine extremely downtuned version of the slowest Beherit tracks. and you might come close. but still find decent amount of originality. Suffocating guitar & bass sound roars in depts. while stiff and heavy drumming. obscure echoing voice and occasional keyboards and effects deliver the final touch for this masterpiece. Don�t expect standard or generic copycat so common in the scene. Ride For Revenge is ready crush with authentic dark cruelty! Full color covers and disc print. Official re-release of the first album! Same material. same cover as original Drakkar version. Cult band from Finland who barely needs introduction. NORTHERN HERITAGE. Official re-release of the 2nd album! Same material. same cover as original Illuminating Void prod version. Cult band from Finland who barely needs introduction. NORTHERN HERITAGE. Finally out after long delays! Completely re-mastered for vinyl record with much more fierce and primitive sound. Now razorsharp guitar work dominating album instead of heavy drum blast. For those who want clean and nice. look for the CD version. Those who was harder and darker. LP is a must. Packaged in full color gatefold sleeve. Fast black metal assault for the strong mind not following the trendy subgenres. Special offer: but LP + Exordium T-shirt for bundle discount price of 20 euro!! T-shirts only available in limited quantities!